Provided that an employee shall be entitled to only one annual increment either on 1st January or 1st July depending on the date of his appointment, promotion or grant of financial upgradation. (2) The increment in respect of an employee appointed or promoted or granted financial upgradation including upgradation under Modified Assured Career Progression Scheme (MACPS) during the period between the 2nd day of January and 1st day of July (both inclusive) shall be granted on 1st day of January and the increment in respect of an employee appointed or promoted or granted financial upgradation including upgradation under MACPS during the period between the 2nd day of July and 1st day of January (both inclusive) shall be granted on 1st day of July. Illustration: (a) In case of an employee appointed or promoted in the normal hierarchy or under MACPS during the period between the 2nd day of July, 2016 and the 1st day of January, 2017, the first increment shall accrue on the 1st day of July, 2017 and thereafter it shall accrue after one year on annual basis. Provided further that the next increment after drawal of increment on 1st day of July, 2016 shall accrue on 1st day of July, 2017. (3) Where two existing Grades in hierarchy are merged and the junior Government servant in the lower Grade happens to draw more pay in the corresponding Level in the revised pay structure than the pay of the senior Government servant, the pay of the senior government servant shall be stepped up to that of his junior from the same date and he shall draw next increment in accordance with this rule. 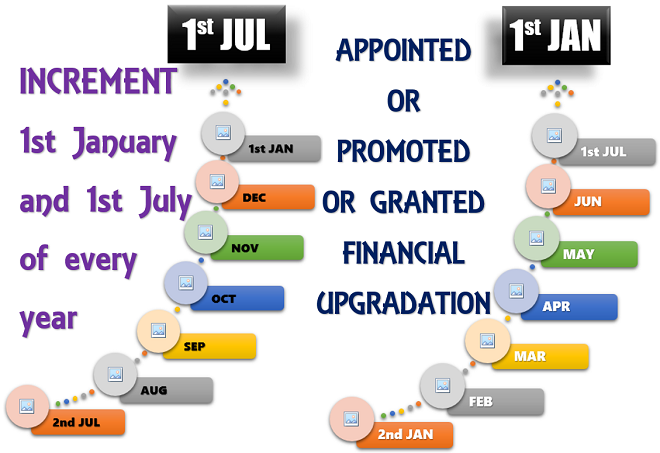 There shall be two dates for grant of increment namely, 1st January and 1st July of every year, instead of existing date of 1st July; provided that an employee shall be entitled to only one annual increment on either one of these two dates depending on the date of appointment, promotion or grant of financial up-gradation. Calculation of annual increment for Central Government employees as per 6th CPC..? hello sir my 6th pay amount is 8110+2400 as on 1.1.2016 please how to count 7th pay ? your pay will be fixed as 8110+2400 = 10510 x 2.57 =27011. As per matrix table corresponding to GP 2400 your pay is 27100/-. My pay + GP is Rs.21840/- as on 1.1.16. I got MACP on 1st March 16 in the GP of Rs.4800/-. Please calculate my pay if I exercise for 2nd option.